At the Chimney House we have always focused on sourcing the best seasonal and local ingredients. 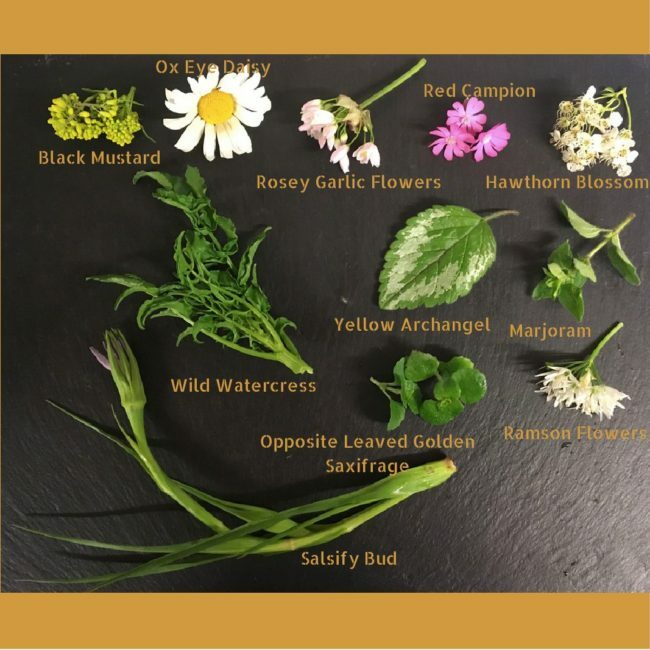 Foraged ingredients naturally fall into this category for us and we enjoy taking our pick from the wonderful native ingredients we have available to us in the UK. Although there are many restaurants introducing these wonderful ingredients to their menus, we often get asked what the different ingredients are, what they taste like and how they are prepared. We thought it would be nice to give you a summary of some of the ingredients we are using presently and what these edible plants offer in taste to our dishes. Ox eyed Daisy – Native to Europe this edible flower has a slight bitter taste and is a good garnish or addition to salads. Black Mustard – Young mustard plant leaves can be eaten as a salad or cooked green. We like to add this to our mutton dishes. Rosey Garlic Flowers – This blossom is part of the wild garlic family and has a mild garlic flavour. Great as a garnish. Red Campion – A slightly sweet plant that is often used as a garnish. Hawthorn Blossom – Usually ready to harvest in May these flowers and traditionally eaten in salads or as a garnish. Yellow Archangel – The young leaves are edible with a slight minty flavour. Often used with our hogged dishes. Marjoram – This plant has sweet pine and citrus flavours and in the oregano family. We use this with our beef dishes and on our tomato and wild herb starter. wild Watercress – Has a wonderful peppery flavour and is often found growing from fresh water sources. Great as garnish or with salads and with no cooking necessary, great for the summer. Opposite leaved golden saxifrage – This plant is wide spread in the UK and has wonderful rounded green leaves with golden flowers amongst them. The leaves taste like watercress and can be eaten raw or cooked as a green. This is used as a garnish on our parfait and pigs head dishes. Ransom Flowers – Wild garlic flowers with a mild garlic taste. Great as a garnish on our slow cooked beef. Salsify Buds – A mild and sweet green flavour and lightly steamed is the perfect green for our pork and hogged dishes. We hope you have found this post interesting and informative, if you feel like it take a look around you on your next walk in the countryside and see if you can spot any of them!!! As the season and availability changes so frequently, we will have many more foraged ingredients to play around with on our dishes soon.